Welcome to the second Getting to Know You Tuesday! Today my guest is Mary Cope. Mary Cope is a freelance writer of romance. 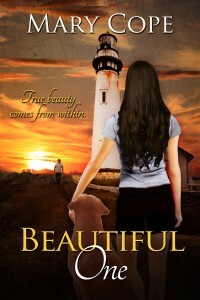 Her book, Beautiful One, is the first in a planned trilogy. She enjoys spending time with her family, baking gourmet cookies, listening to music and taking long walks with her yellow Labrador, Maggie. How about three books and two movies? Well, I’m so glad I did. The story was realistic, touching, and yes, sad. But, it was a great read and I highly recommend it. This story conveyed a great message and it was a quick read. I loved the relationship between the two characters. I chose these two movies because every time I’m flipping channels and they happen to be on, I stop what I’m doing and end up watching them. Bridget Jones’s Diary and When Harry Met Sally. Realistic, youthful, musically-inspired, entertaining, and touching. I am not really a “girlie girl,” but if I had to pick something it would be getting a massage. I absolutely love a good massage! ~ Wine or Beer? It depends, if it’s a hot day and I’m hanging out poolside, I’ll drink a beer. If I’m enjoying a nice dinner, a glass of wine. ~ Perfume or Jewelry? I prefer jewelry, especially silver jewelry. ~ Painted nails or Au Natural? My nails are usually natural but if I do polish them I will choose a light pink or clear polish. ~ Romantic Dinner at Home or Out? Romantic dinner out, complete with candles, a beautiful view, and a piano playing soft music in the background. ~ Roses or Lilies? My favorite flowers are Sunflowers. They seem happy to me but between roses or lilies, I’d choose pink or yellow roses. One of my leading men had “the look” of my first love. The other leading man was a complete fantasy. Plan the evening from start to finish. Simple things make me happy so it wouldn’t matter what we did as long as I just had to show up. I enjoy people watching but when I am creating characters they come from my imagination. Spend time with my friends, listen to live music, go on long walks with my dog and bake. I don’t care for Jamba Juice but I love Starbucks coffee…I’m simple, just a drip coffee with cream. I’m simple, just a drip coffee with cream although, I do like a good cappuccino every once in a while. I usually look at the end-caps and see which books they are highlighting. Then I head over to the YA and romance section. I travel light, usually just a wallet, keys and my cell phone. Fun-loving, lighthearted, loyal, and giving. Thanks for participating, Mary! I love the YA section of our library, and I totally agree with you about a nice cold beer when hanging out with friends! Mary’s new book is called Beautiful One. Thanks for posting such a great interview on Mary. I’m currently reading her novel and I’m looking forward to reviewing it for my Twitter and Facebook followers. Thank you Angeline, I hope you’re enjoying it! What a lovely interview!! I tweeted. Thank you Ella, and thanks for the tweet! Thank you for having me on your blog Nancy!